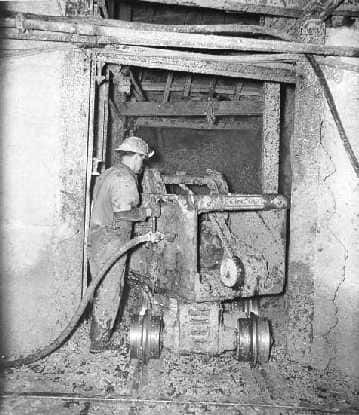 In 1949, Quebec asbestos miners launched one of the most bitter strikes in the province's history, challenging the iron rule of Quebec authority and foreshadowing a revolution in French Canadian society. On February 14, 1949, 5,000 miners in Asbestos and Thetford, Quebec began an illegal strike for better wages and working conditions against their American-owned company, Johns Manville. Rudolf Hamel, a union leader, said French Canadian workers were historically treated unfairly by their bosses. "People had always endured working conditions that bordered on slavery, and the favouring of English workers, who made up about 10% of the work force. Everything was done in English. The English had all the best jobs. After that, French Canadians were hired as white Negroes to fill the gaps." Quebec labour unions had traditionally maintained non-confrontational relations with their bosses so the strike represented an unprecedented situation. 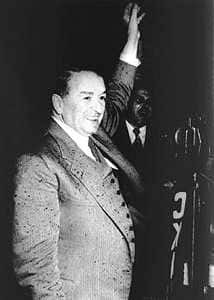 But most remarkable about the strike was the workers challenge to the authority of powerful and popular Quebec Premier Maurice Duplessis, who controlled every aspect of Quebec society with an iron fist. Duplessis welcomed American investment. He was a nationalist but he believed Quebecs prosperity rested on giving capitalists of all languages a free hand. "Hundreds of millions in capital has been invested to develop our resources. Let me repeat: American capital, English capital, French capital: Welcome!" The Montreal newspaper Le Devoir sent 29-year-old reporter Gérard Pelletier to report on the strike. "It is the official ideology of the time," he wrote, "there was simply no place for the working class. Factory workers were seen as intruders. They had the bad taste to exist." But now factory workers were becoming vocal and the strike was gaining momentum beyond the long reach of Duplessis. For the first time Quebec society became aware of the plight of the workers and the government's attempts to suppress them. All strata of Quebec society - labour, church and intelligentsia - began to join together in one cause. "The working class is the victim of a conspiracy aimed at crushing them, and when there is a conspiracy to crush the working class, it's the Church's duty to intervene. We value people more than capital." Pelletier met an old friend drawn to the strike, a fiery labour leader named Jean Marchand. A 29-year-old lawyer who has just returned to Quebec after a world tour also joined them. His name was Pierre Elliott Trudeau. His presence was electrifying. "At the time," Pelletier wrote, "he had a blond beard, so the striking miners nicknamed him 'St. Joseph'! But when he took the floor at a meeting, they listened to him very attentively. He knew how to speak on matters of justice, democracy and freedom in a way that was highly relevant to the situation." Trudeau, Pelletier and Marchand would later become known as the "Three Wise Men" from Quebec when Prime Minister Lester Pearson recruited them to run for the federal Liberal party in the early 1960s. All became Cabinet ministers in the Pearson government. The asbestos strike was the first time the three met. As the strike dragged on, workers became more militant, blocking the roads to the town. Strikebreakers were brought in, resulting in an angry confrontation between the strikers and police. "This is about an admitted attempt," Duplessis warned, "encouraged from outside, to challenge and break the State's authority. That is intolerable. Whoever deviates from this policy that I have established, privately or publicly, will be expelled from the Union Nationale." On May 6, at daybreak, the government sent in four hundred police armed with guns, tear gas and billy clubs who rousted the miners, dragging some from the church where they sought sanctuary. A striker named Alphonse Vallières was locked in a small room and questioned by police. "I told them yesterday that the cops fired at us. One of them called me a liar. He pounces and curses me, hits me in the side of the mouth with his fist. While I was trying to protect my face, the other one hit me across the ribs with his baton." With the help of the Quebec public who provided money and food, the strike lasted more than five months. Finally both sides reached a negotiated settlement in July 1959. The strikers didn't get the wage increase they wanted (they received five cents an hour rather than 15 cents). However the strike earned the respect of the employer and the miners wages were raised within a year, making Quebec miners the highest paid in Canada. "I want to thank you with all my heart for your most sensitive expression of sympathy on the occasion of my abrupt departure from Montreal. I had felt the storm approaching for some time - its violence broke my wings." In Quebec the Asbestos strike left a long legacy. It was the first glimmering of an organized anti-Duplessis opposition. In the years that followed, the voice of the French Canadian workers and the public would continue to rise heralding in a new era of Quebec nationalism.